In my home, we go through a lot of eggs. Search “breakfast sandwich capital of Canada” online and the address to our downtown Edmonton apartment may be the suggested link. In our kitchen, good eggs are a necessity, not a luxury, which is how I first came to know one of the staple vendors of City Market Downtown, Sunshine Organic Farm. Open year-round, Ed and Sherry Horvath sell their organic, family-farm-raised beef, pork, chicken, turkey, eggs and sausages at the downtown farmers’ market. This winter, I contacted Sherry to learn what it’s like to be a vendor at a winter market, hear some of the history of their farm, and get to know the family behind it all (you can read what I learned in this post!) During our incredibly lovely chat, Sherry generously invited me to visit them at Sunshine Organic Farm in Alsike that spring. In May, I took Sherry up on her offer and enjoyed a sunny drive through the country to their place. Upon arrival, Sherry called across the yard and brought me right into their hen house; an impressive homemade barn built using hay from their farm. We said hellos as Sherry finished collecting the day’s eggs, then hopped onto the Kubota to scoot across the yard to their certified egg cleaning, sorting and packaging room. Day dreaming of ways I could enjoy the eight dozen eggs we had just carried inside, I looked on as Sherry explained the different stations each egg passes through before finally making it into one of their familiar Sunshine Organic Farm branded cartons. Unlike most other market vendors, the Horvath’s farm is certified to grade eggs, which means you can buy cartons of small, medium, large or extra-large sized eggs. Especially unique to the Horvaths’ egg facility is the sorting machine; a vintage 1943 (“same age as Ed,” Sherry giggled) egg sorter they picked up from an old barn in Saskatchewan. The machine was more like something you would expect to find in Willy Wonka’s chocolate factory, and a total joy to see in operation. Eggs roll down a brightly lit shaft, which allows the operator to inspect for shadows inside (an egg you wouldn’t want to eat) or cracks in the shell. Next, a series of pedals bounce the egg along until it finally becomes too heavy to hold, and rolls into the appropriate container for its size. For a machine so large, it had such a basic job, and left me longing for a bygone era. The next stop on our tour was like a trip back in time in the life of our eggs — or perhaps a look to the future — as Sherry introduced me to their newly arrived swarm of chicks. After immediately having one plopped into my hands, I “ooh’d” and “aww’d’ as I watched hundreds of other yellow peeping puffs scurry around the floor and climb on top of each other. Sherry explained that if I were to see the same birds in just one week, I would hardly recognize them, bigger and covered in feathers. After giving the chicks some more feed (which is organically grown then mixed on site) and checking their water, we hopped back on the Kubota and left the yard to check out the pasture, where these birds will live in the not too distant future. We pulled up to a series of short, metal chicken houses with tarp roofs and open fenced sides. They’re sitting in a field of organically grown alfalfa, which is what the chickens will feed on for the rest of their lives. Every day, when the chickens are out in the field, the Horvaths come out and, as a team, move the houses by one length, giving the birds new food to graze. Sherry explained this process is what defines “pasture poultry,” the kind of chicken you can purchase from them at the market. While the pasture houses are nice and open for the chickens, Sherry explained that they are heavy, challenging to move, and require daily opening and closing of the tarped roof whenever there is rain. A big project for them this year will be to build lighter, brighter hoop houses — a treat for both the chickens and the Horvaths. We rode the Kubota around the edge of the field, took a peek at their cattle pasture, then made a final stop at something I recognized – their market trailer. I asked Sherry when they start getting ready for the Saturday market each week, and am only somewhat surprised to hear preparation usually starts on Monday. Inventories of poultry, pork, beef and eggs need to be taken, lists have to be written, coolers re-organized and repacked, and eggs collected, cleaned, sorted and packaged. In between all that, endless hours of work go into raising animals, growing and mixing feed, butchering and packaging meat, fixing equipment, and of course, dreaming up and planning future projects to improve the farm or make things more efficient and sustainable. On Saturday morning, Ed, Sherry and their family are up with the sun, getting ready for a long but fun day at the downtown market. A few days later, I stopped by the Sunshine Organic Farm trailer at the downtown market to say hi and thanks again. Sherry passes me a dozen eggs (some of the ones I saw her collect, perhaps) along with a kind smile, cementing my opinion that market vendors are some of the best people you could ever meet, or be lucky enough to get to know. I know she’s been busy, likely non-stop, and I recognize I’m probably not aware of even half of the work their family needs to accomplish every day to run their business, make their living, and provide market goers with fresh, sustainably produced food. Yet still, here they are smiling, chatting and soaking up the atmosphere of an urban farmers’ market. 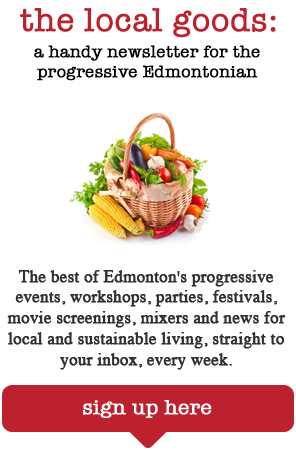 After this incredibly fun and enlightening experience, I would highly recommend your next visit to an Edmonton farmers’ market includes a friendly handshake with one of your favourite vendors. Introduce yourself, ask questions and get to know the person behind the product. You will be so glad you did! Ed and Sherry are by far my favorite market vendors, I have been buying eggs and meat from them for years at City Hall and downtown. Great article! Cookies for all at Bloom Cookie Co. Copyright © 2019 The Local Good | Web design by Derek Weisbeck, Logo by Jason Blower and banner image by Laurice Block.